I was recently invited to present at a law firm retreat on the topic of closing skills, presumably in the hopes that my remarks would magically transform reluctant partners into willing rainmakers. As the partner in charge of retreat planning said to me, "We need to give our weaker partners a shot at carrying their own weight, otherwise we need to make some changes." Before agreeing to present at the retreat, I asked the partner if the successful rainmakers would be in attendance and open to new ideas as well. He assured me that attendance was mandatory for all, and if I needed help the successful rainmakers would be happy to contribute anecdotes of their own successful techniques. We then proceeded to talk basketball, as we both shared an interest in an NBA team that was likely headed for the playoffs. When I delivered my remarks at the retreat, I included a number of basketball analogies. Yes, I know, sports analogies are trite and overused and often gender-biased. But the quote providing the theme for my remarks was offered by legendary UCLA basketball coach John Wooden, whom I've quoted previously, and has wide appeal: "It takes ten hands to make a basket." In short, my goal was to bust the myth that rainmaking is a skill akin to scoring in basketball, that a successful law firm simply needs more scorers to thrive. The reality is it takes a coordinated effort between lawyers who are successful at networking and generating visibility for the firm, and lawyers who can not only successfully understand a client's business challenges but create custom solutions to address the challenges, and lawyers who deliver the legal work necessary to achieve the desired outcome, and lawyers tasked with managing the project and ensuring that it stays on track and on budget, and lawyers who continually communicate with the client to minimize surprises and stay abreast of new developments, and staff professionals who provide support for all of the above, and so on. This is not unlike a basketball game in which one player boxes out the opponent and secures a rebound, and another player pushes the ball up court, and another player sets a screen to free a teammate, and another drives to the basket and draws the attention of several defenders, and another player spots up in the corner so when the driving player passes the ball he takes, and makes, the open shot. Beautiful basketball is a team sport, and so is running a successful law firm. Rainmaking is not the same as networking. While being visible in the community of clients and potential clients is important, it's only one facet of rainmaking. Some lawyers enjoy, or at least can tolerate, the cocktail and conference circuit, and the visibility is undoubtedly beneficial. But simply becoming known is only part of the equation. And there are many ways to become visible, including authoring scholarly articles on substantive legal matters, blogging about emerging trends of interest to clients, using social media to become known "virtually" in the desired circles, speaking at client events, volunteering on charity boards alongside potential clients, and much more. There are opportunities for lawyers of all personality styles to successfully generate visibility. Rainmaking is not the same as asking for the business. There are countless sales books on closing techniques, most of which are helpful when you've run out of kindling for your fireplace or lighter fluid for your charcoal grill. But as guides to successful professional tactics to win business, most do more damage than good. When's the last time you, as a consumer of goods and services, felt great about a purchase in which you were manipulated to buy something you didn't need, or paid a price greater than necessary? Closing techniques are about manipulation, but successful consultative selling is about matching the benefits of your offering to a client's stated needs. If your lawyers are meeting a lot of prospective clients but not winning new engagements, it's likely they need work on asking questions to better understand needs, not making clever statements to entice the prospect to buy. Rainmaking is not the same as discounting. In every sales organization, there's always a sales manager or executive we call the "hero." She's the one that demands all of her salespeople remain firm on price but when a sale has to be made, often at the end of the month or the quarter, she will offer the brilliant insight that only a seasoned manager of special talents has, and promise a steep discount to close the deal. These heroes are toxic. The salespeople aren't allowed to use the same tactics and the clients know it, so savvy clients have the patience to wait until the hero is called in. Law firms that employ undisciplined discounting to win work erode profitability and create internal price pressure because clients accustomed to discounts from practice A will demand it from practice B. If your primary tactic to win work is lowering the price, then your rates are either too high to start or you haven't demonstrated sufficient value to the client to justify your expense. Organizations that don't perpetually rely on discounts focus on quantifying the cost to the client of not acting, and quantifying the benefits of a favorable outcome, and quantifying the value the firm can bring in delivering the desired outcome. Rainmaking is not the same as growing top line revenue. Whether it's winning new engagements or recruiting laterals with a portable book of business, many law firms focus on new revenue. As the old saying goes, all revenue is good revenue. But like many old things -- eight-track tape players and wooden skis come to mind -- we should stop using it. What this approach ignores is the cost of sales. Any analysis of law firm finances demonstrates that it's far more efficient, and far more likely, to cross-sell services to existing clients than to sell new services to new clients. Yet most firms put far more time and energy into selling services to new clients while ignoring effective methods to delight and retain existing clients. 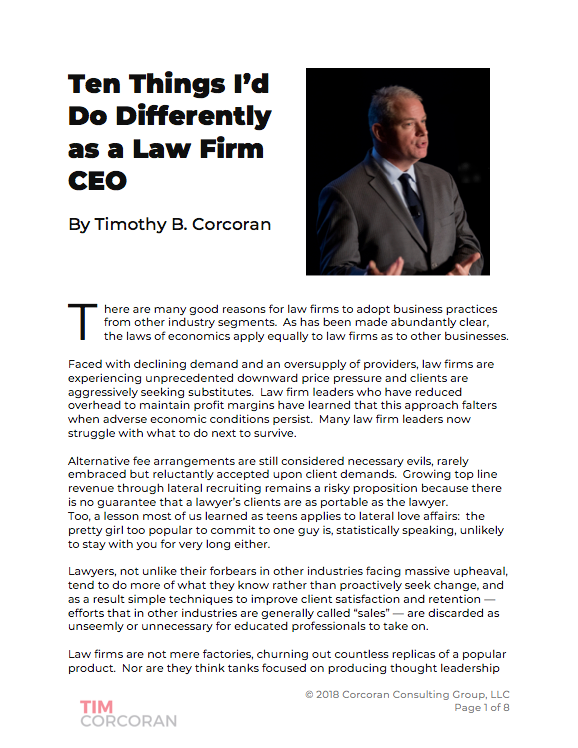 And no matter how many times we hear that clients treasure law firms that provide predictability, we fail to make the connection that excellent lawyers who rely on deep subject matter expertise to manage legal projects tightly are as critical to retention (and revenue) as those who bring in new engagements. Rainmaking is not the same as generating profit. Too often firms focus on top line revenue without regard to the cost of delivery. If I can earn $5 million in new fees, but it takes $6 million to deliver the legal work, this is obviously a bad idea -- yet many jump at the opportunity, presumably under the delusion that what they lack in profit potential they can make up with poor math skills. Even if I can deliver the legal work for $4.5M and generate $0.5 million in profit, it may still be a bad idea if those same resources devoted elsewhere could have delivered $1 million in profit. Managing legal projects profitably has as much (if not more) to do with service delivery than rates. If the client will only pay $1 million for legal services that once generated $2 million in fees, the savvy firms find ways to lower the cost of delivery so as to turn a profit at the lower fee level. The clueless firms continue to hunt for dumb clients willing to pay double the market value, possibly by coercing them through clever closing techniques. Managing a modern law firm is challenging, just as making the playoffs is difficult for a basketball team in a competitive league. Those basketball teams that identify the various skills of their players and combine them together in unique ways to maximize strengths, minimize weaknesses, and exploit opportunities presented by competitors, tend to win more games and championships than those teams who believe recruiting top scorers is the key ingredient for success. Law firms must also recognize that rainmaking isn't about clever closing techniques or finding that elusive client willing to pay far more than anyone else for a service. It's about maximizing all of the firm's resources to find, win, and keep clients, and this requires everyone to contribute. And while many contributions won't appear on the stat sheet after the game, champions know that it takes the entire team to win.